There are two types of these companies. One, simply takes a portion of your monthly income, negotiates with your credit card companies to stop or lower interest, and, in return, makes a monthly payment to each company. After several years of those payments your debts will be gone. Assuming, of course that you can make all the monthly payments to the credit negotiator and assuming you don’t incur any new debt. Oh yes, you’ll pay them a percentage of your income to do this – often several hundred dollars or more a year. The other type of company takes a monthly payment from you and saves it. 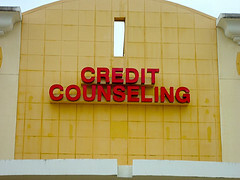 They notify your creditors that they are working to get them paid. Then, once they have 50% or more of the balance owed a credit card company; they negotiate to pay off the card in full for that percentage. This usually works although it’s nothing you can’t do yourself; and you are paying a monthly fee to allow the company to do this for you. Since it can take several years to raise enough money to do this and the negotiating company is being paid monthly this can be quite costly. And, of course, if you miss a payment or two, you’ll still be liable for the credit card balances. Meanwhile, whichever of the above programs you use, your credit score won’t improve until everything is paid off. Don’t be fooled by the claims of “nonprofit” companies. These credit negotiators may not be a “for profit company,” but you’ll still pay for the service at a hefty monthly amount. Now let’s compare those programs with a simply bankruptcy. You’ll pay your attorney a one-time fee – often less than $2,000 – and your debts will be gone in 3 to 4 months. And you’ll start rebuilding your credit score right away.